What is laser die cutting machine? Laser die cutting machine is used for die board cutting with laser beam according to the die diagram. Laser die cutting machine has high cutting speed compared with handmaking die. And job exchanging is fast as well. Laser die cutting machine includes low power laser die cutting machine and high power laser die cutting machine. Low power laser die cutting machine can cut die board through, but for thicker one, it is not as good as high power. Also the kerf cutting accuracy is also much lower than high power laser die cutting machine. High power laser die cutting machine needs complicated assitant system, such as gas supplying, cooling system, laser tube, laser lens etc. Once the kerf cutting accuracy gets going down, there might be lots of factors which affect it. So the machine maintenance cost is also high. But high power laser die cutting machine is still widely used in die making because it is fast. 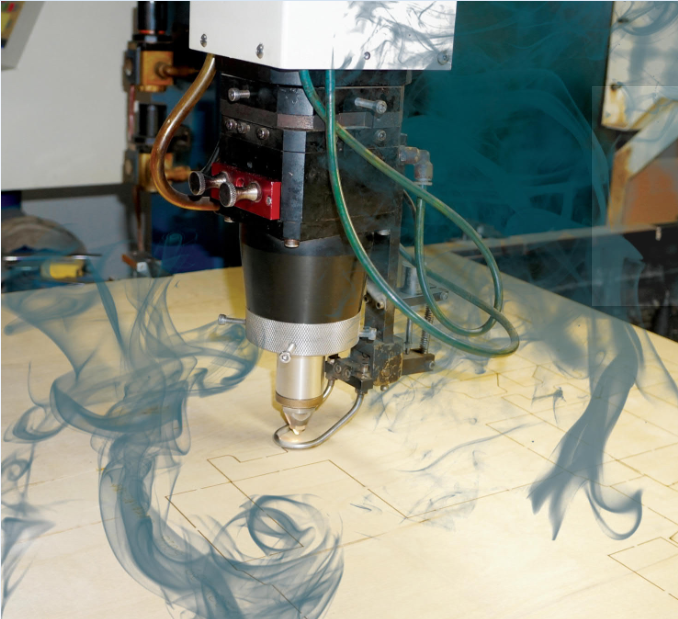 During processing, dense smoke and even toxic gas would be produced as laser burns the die sheet. some purifying system is installed, but this problem can't be still avoided.